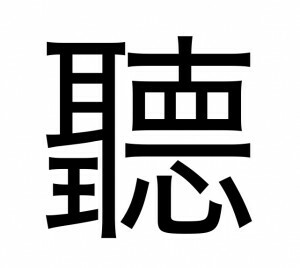 This is the Chinese symbol for “To Listen”. It is wonderful in how it pulls together several elements required to fully listen to another person. When one of the elements is not present, true listening is incomplete. It is intuitive. We know this. Yet, we forget and fail to listen every day of our lives. For leadership to thrive we need to both listen and encourage others to listen. It is why I refer to dialogue often in my writing. 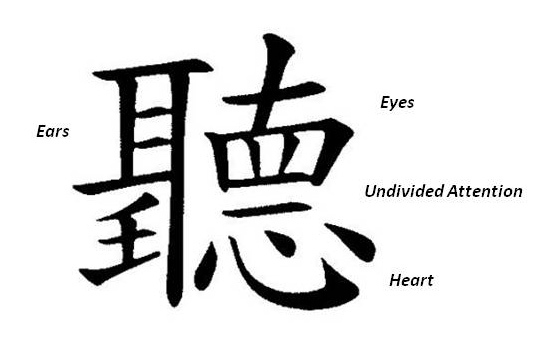 I list the elements below that make up the Chinese symbol for “To Listen“. Something for us to ponder for our success as leaders. I question if anything is more important. Leaders need empathy. I do not know how a leader with little empathy can sustain success. Empathy is the means to reach out and touch the heart of the person we are listening to and shorten the distance between us. Be present. There is no past or future. Here and now, you are my focus. I am listening to you and not waiting to speak myself. Focus on hearing the speaker. There is voice and inflection and the tone of the voice. It changes as we speak. Do I hear the full message? We can pick up so much information as we hear someone speak to us. Our eyes are amazing. We see so much, but focus on so little. Maybe with enough focus we can get a glimpse into the soul of the person we are listening to and for once understand. Sometimes it hurts when people hear a voice but not a heart. Maybe they do hear both. An excellent piece about understanding. Thanks for the thoughtful response. Hear with the heart … yes. Fantastic post and choice of Winston Churchill quote. People surely do forget to listen and I wonder if it’s from decades of trying to teach our kids to “speak up” and “have a voice” before they are old enough to have anything particularly important to say! Thanks for the visit and comment. Good point on how we raise our children. In school too on how we encourage kids to speak up and the loudest get the praise. I tell my kids that there is so much power in listening to others. It is the first step for them to listen to you. This is a nice write up! I am curious how do you say the symbol in Chinese? Thanks! Thanks for the visit. I also wonder how this sounds in Chinese. Thanks for bringing me back to one of my favorite posts. All the best to you.